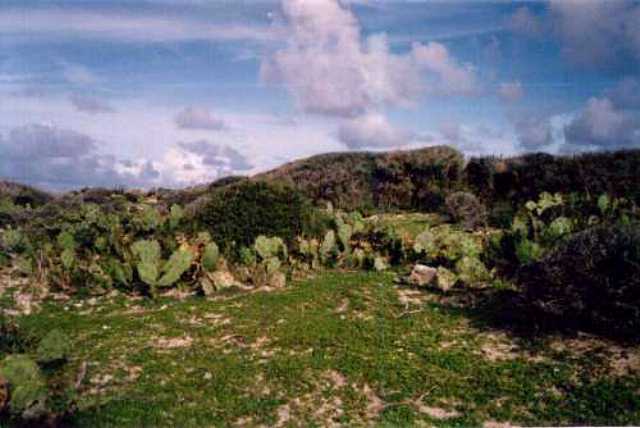 Off the eastern tip of Anguilla is uninhabited Scrub Island, about 3 miles square and fun to visit. 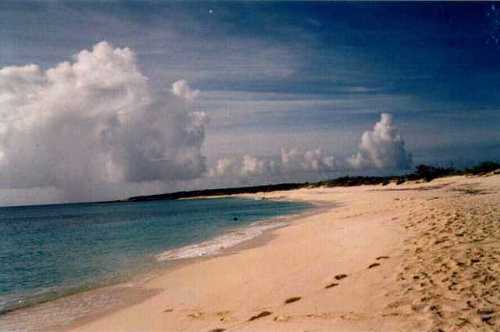 On the leeward side is a beautiful white sand beach which usually has calm waters (click picture for a larger image). It is the only one in Anguilla that faces completely away from the prevailing winds and seas (since Anguilla runs east-west and the winds come from the east). 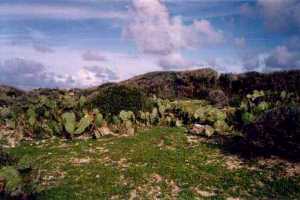 The interior of Scrub consists of rolling low hills, soft and green more like Scotland than Anguilla. It is an easy walk to the other side of the island. The only inhabitants are wild goats that grow fat in the rainy season and skinny in the dry season (they get water then by eating the pear cactus on the island). Catch a ride over on Junior's or Mike's glassbottom boat from Shoal Bay or Island Harbour. Or on Keg's wide, stable fishing boat. Or just drop into Smitty's Seaside Bar and Restaurant in Island Harbour and ask him to find Shawn or one of the other boaters to take you over. But take some cold drinks with you, because there aren't any bars on Scrub Island yet. And there aren't any protected harbours on Scrub either, so it is sometimes impossible to land in high seas. When you get over, you can just play on the beach in Scrub Bay where you land (see blue X on the map), or you can take a hike to explore the island. You will need walking shoes or sport sandals. Remember, Scrub Island is private property, except for the beach which is public, like all beaches in Anguilla. So be respectful. If you have any questions about the island, you can contact Olive Hodge or any member of the family at the Anguilla Drug Store. 264-497-2738. In two hours you can hike most of the island and when you make it back to the beach, a dip in the ocean will be very refreshing. For more information on Anguilla, read the Anguilla Local News.